Why do we blog? I can’t answer for everyone, but I know I’m here–at least in part–to indulge in fantasy. Though I try to (mostly) write about real life, I read your blogs for vicarious reasons. Thanks to your posts, I’ve traveled to places I may never see, read books I’ve yet to hear of, grown gardens I can’t manage to grow myself, tried new recipes I don’t seem to make time for, and heard music I never imagined I’d like. Your blogs rock and I appreciate being able to expand my horizons without having to leave my laptop. Today, let’s visit two of those horizons. Horizon/Fantasy #1) Gardening. Those of you posting your crops have me green with envy. Even at my best, I’m a less than stellar gardener. Planting, watering, weeding… Most years it seems too much bother (and mosquito-infested) to deal with, especially when there are so many amazing farmers’ markets locally. That said, my husband is the farmer type and while he’s a bit citi-fied by now (you’re welcome, darling), he still plants a few tomatoes and green beans and keeps the berry bushes and grape vines going. For all of this, I’m grateful, but I also like a few herbs to call my own. But this year? I only managed one mint plant. Horizon/Fantasy #2) Cocktails. Call me a dreamer, but I imagine my husband and I enjoying a classy adult beverage come evening. But reality says we’re always driving one of the kids somewhere and it’s a rare evening when we have a few moments to kick back and relax. So I indulge this fantasy by reading blogs and books. And buying cocktail glasses at thrift stores. It’s fun to have a book (or eight) to peruse and pretty glasses for serving when the mood for a sipper strikes. And that’s why when the mojito urge hit, I gathered a handful of mint sprigs and my copy of Storied Sips and went to town. And it was so amazing and refreshing that I made one again the next night. The next night I muddled a few blueberries with the mint and ended up with a pink drink. Summer seems made for mojitos and it’s become my cocktail of choice when time allows. I’ve yet to follow a recipe exactly, but generally muddle a handful of mint and a few splashes of rum in the bottom of a glass, then add the juice of a lime and about a tablespoon of agave syrup. Shaken with ice, the drink is strained into a (pretty) glass and topped with seltzer. I tend to make mine plenty lime-y, often ending up with pulp in the glass, but of course amounts are adjustable. It’s summertime (at least in the Northern hemisphere) and the living is easy. Here’s to fabulous gardens–real or imagined–and a lovely cocktail at the end of the day. 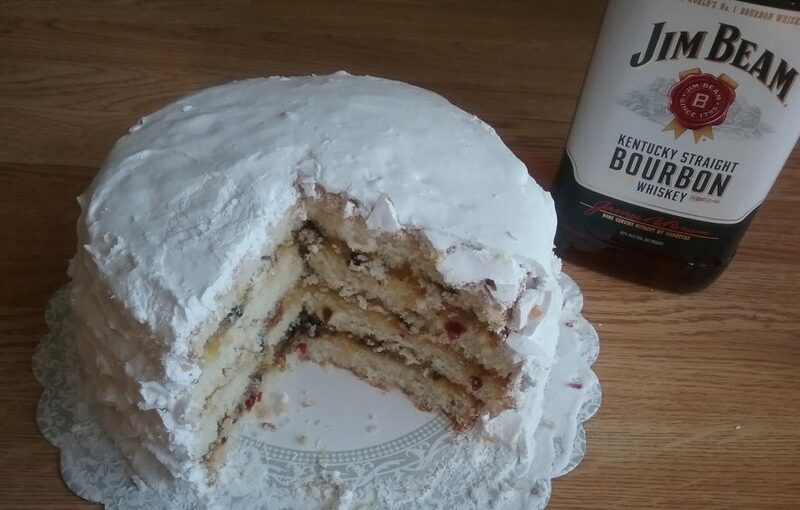 your cake made an impression, that’s for sure. One of these days I WILL make it! Agreed on an earlier comment about taking July off from the alphabet. Works here. lol, no cooking at your mum’s huh? Am sure Shanna would like the time off, too. I’m here whenever it’s time to start up again. Still no clue on the X.
Ok, looks like we have time to think of X then! I would gladly share my garden goodies if I could! If it makes you feel better, yes, I do sometimes get eaten alive by Mosquitos out there! I spray the bug spray on liberally and still they find me! And yes, the weeding stinks. I have a big section overrun with weeds now. I’ll get to it when I find the time! Yes to the mojito!! Like you I dream of my husband and I sitting on the porch with an adult beverage. Right now it is too hot and the weekdays too busy. Luckily we do manage it quite often in the spring to early summer and fall. Winter with an Irish coffee or coffee with Bailey’s is also pleasant! Yes to the blueberries mojito, I actually have a blueberry cocktail to post myself. Just need to photograph one, guess that means I just might have to drink one tonight! You are one dedicated Mama to pull off the gardening haul that you do despite the bugs, etc. I’m just not that into it! Part of it is having to go down deck steps and all the way to the other side of our lawn (that said, it’s not like we live on a big lot) to get to the garden. So many other things that need to get done! And I love farmers’ markets. though it would be nice to pluck it from the garden myself. I am looking forward to my blueberry cocktail already, a blueberry smash. I just have to cross the driveway to get to my garden! I like our Farmer’s market but it is just once a week. We have others, but they are small and the time just doesn’t work for me. Who wants to go to the market in the late afternoon in the sweltering heat of the summer? Certainly not me!! summer seems made for mojitos. yes. and Beth, the blue cocktail is for you! I just need to give it a French name. Any suggestions? When are you inviting us all over to share??? I think your blog delights much in the same way you find pleasure from others. Your explorations have given me so many fantastic ideas and recipes – and more than that – always with a smile and an enthusiasm that is unparalleled. Thank you for all of it! I love this post, and you know exactly why! A new cocktail recipe to try of course. You know I have to add this one to the list. I’ve even got the mint growing, at no result of anything this anything but green thumb has done. It is clearly volunteering for it’s very own upcoming mojito moment! hey, bonnie–thanks 🙂 I think mojitos are why mint exists. Can think of no better explanation. Unless we’re talking mint juleps, haha. Think of me next time you make a mojito. And on that subject, we need to get studying so we can become certified and professional mixologists. Will report in on that soon I hope. I’ll be over shortly. I’ll bring the apps, you make the cocktails! Thanks, Kloe. Will you be gardening in your new home? I can see how you are in a position in which you have absolutely no say. You must make mojitos. note that my bottle is on the large end. (it was less spendy per oz than the smaller bottle–am thrifty that way) Happy to share! Enjoy the links. And thank you for the inspiration you repeatedly put out there. Great post Liz, I so enjoy your blog and am glad you do what you do. I am particularly fond of mojitos thats why I have mint in my garden although today I had to sort through weeds which have taken over to find my mint. lol, you had to hunt down your mint. I’m hoping my grows more quickly as the mojito-a-day thing is depleting it faster than it grows right now. Good luck on your end! Well you know what they say, a cocktail a day will keep the blues away! (I just made that up, lol, but it sounds good to me!). I can’t drink much (lightweight), but I do love whipping up cocktails now and again, especially during summer. Mojitos will now be on my brain until I can make it! Thank you for thinking of me in your post, Liz. I haven’t really answered the question why I blog, but your reasons are definitely at the top of my list. Blogging and participating in this online community has opened my eyes to so many possibilities, and not just about food. Thanks for the lovely sentiments in this post, and also, I only managed one basil plant this year! Am with you, Ngan, in not being able to drink much. Not feeling well the next day isn’t an option when you’re running around with your kids (or job). So for sure I talk/write/read/think about drinking more than I do. 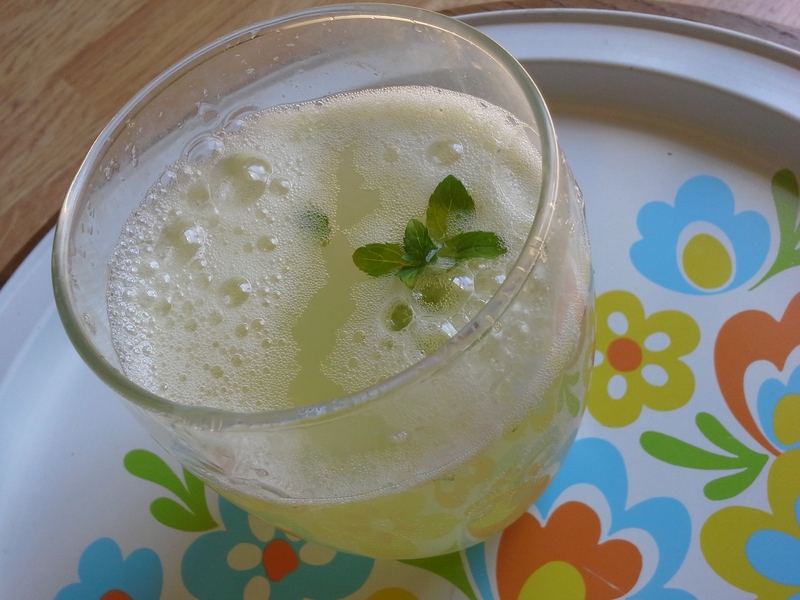 You can do a lot with basil–my mom gave me a bunch (another reason why I don’t have to grow herbs–she keeps me in supply) and I’m hoping to muddle a few in some sort of summery drink. Any ideas? Thanks for coming over and being a part of this community! We are not gardeners either (except flowers!) but we, too, have a mint plant, to feed my husband’s obsession with mint juleps. I’ll push for mojito experimentation next! You’re reading my mind, Kerry! Was singing the praises of mojitos all through the comments until I realized that mint is also important in mint juleps. And being a bourbon girl, I’m soon off on my next julep adventure. I found a twist in a WP blog a year or so ago and it’s become my favorite way to make it. Lemon juice gives it a better flavor balance. Would your husband like? 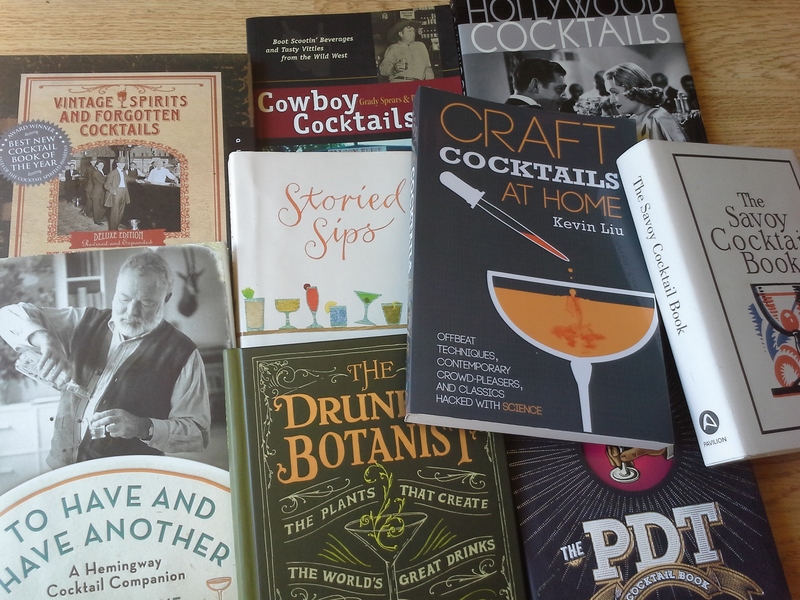 Love all of those Cocktail Books :)!!! Delicious Liz!! Love this post. Because of your suggested, I purchased, “Hollywood Cocktails” and couldn’t put it down until I finished reading it–recipes and all! Thanks, CCU 🙂 I bet you have a good collection of baking books! Would be fun to borrow from each others libraries. I love mojitos! I spent a year living in Havana, so have had them made with Cuban rum, which is particularly delicious (even in it’s own, and I am not the type of gal that likes that type of thing). I love the idea of using agave instead of sugar – I am going to steal that idea from you next time I make one. Which will probably be soon, as I am craving one after looking at the pink one you posted here. Yum!! tell me more about this Cuban rum 🙂 I have a bottle of cachaca (Brazilian rum? ), but don’t know much about rum in general. Agave is my go-to sub for simple syrup as 1) it’s even simpler than simple syrup and 2) it has a more interesting flavor. Hope your get your mojito fix soon! This is the rum I am talking about: http://havana-club.com. I believe it is only available in Cuba, so every time I’m down there I bring a bottle or two in my luggage. The 7 year is my favourite. 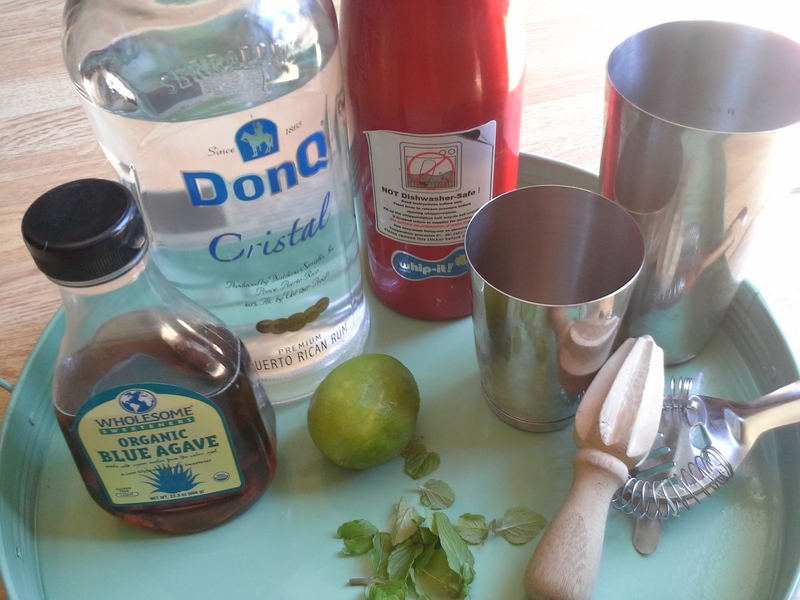 It’s almost a sin to use it in a mixed drink, but it makes such fabulous mojitos! Thanks, Chitra. Hopped over to your place (even on facebook 🙂 ) and am impressed. You do good things in the kitchen! I was told there would be mojitos and I am not disappointed. That looks real good. Tee Gee Ey Ef, eh? Ahoy, matey 🙂 Thanks for coming by for the mojitos. Um, yes, tee gee ey ef, eh. Or if I was amb you would say tee gee ey ef, aye. Carry on, then! I love how you’re living vicariously through all these blogs! How fun! I just thought, hmmm, wonder what Liz is up to…so, I’m showing up a little late for this post but glad I did. You have just inspired me to make mojito’s. I haven’t had one in a few years and now that I’ve read you post I can’t get the idea of refreshing lime minty flavor out of my mind. 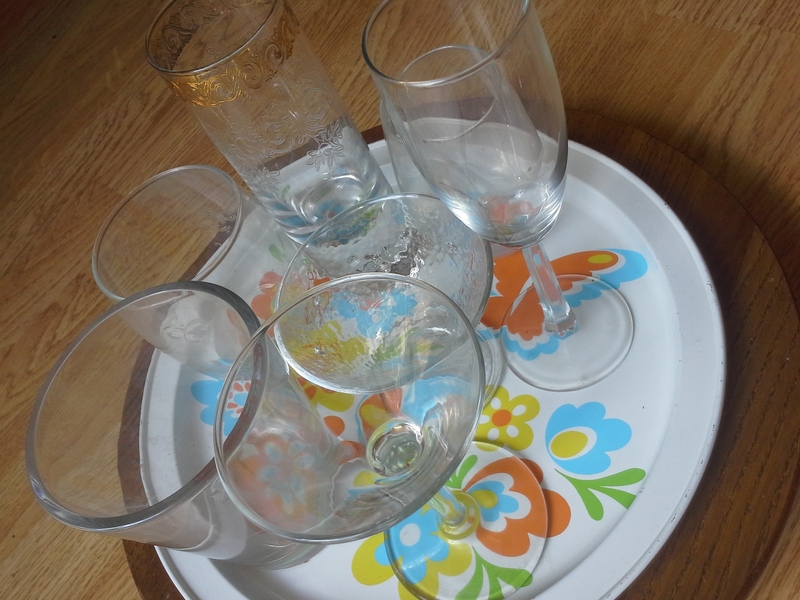 I love buying cocktail glasses at the thrift store too. Uh, well, I like buying anything at the thrift store!! Yes to the thrift store 🙂 Love love love a good thrift store. Hope you got your mojito! I love those cocktail glasses. Having a fun glass makes a drink just that much better. Mojitos really are great for summer- so refreshing! Agreed on the cocktail glasses, Mary. Yes to making a good drink better. Thanks, May! Herbs are easy enough to keep alive. I’m just not a good caretaker of plants. Already enough on my plate with kids, haha. 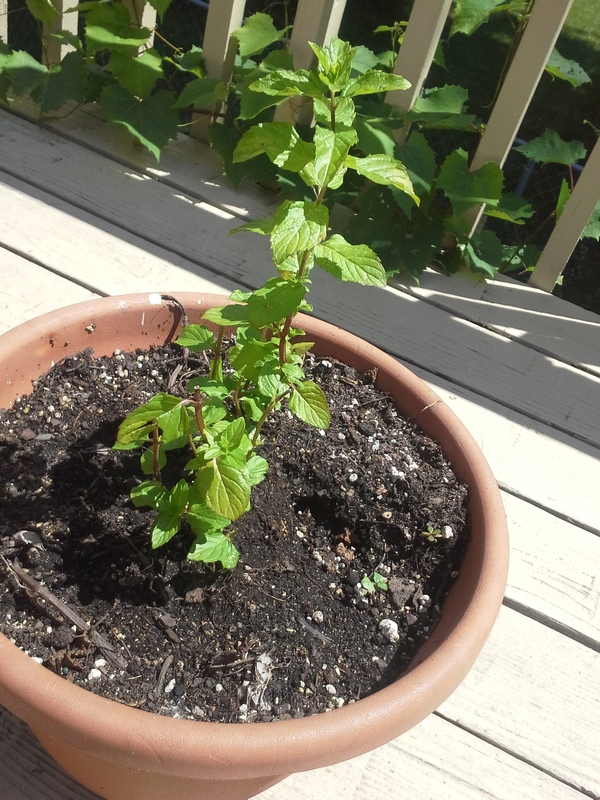 Mint is especially easy though as it just grows and grows and grows. If you plant it in a garden, it will completely take over so it’s best potted. A mojito and summer…perfect. 🙂 Yes…blogging is rewarding for all the inspiration we get from all of our blogging friends. Thanks, Karen 🙂 Love meeting new folks here. Always new things to learn. Nice to see what goes into a mojito. Fresh mint just picked from the source sounds lovely. I should try to make it at home instead of going to the bar, though I have to save the cocktails for the weekends now. I start grad school in chemistry/biochemistry on Monday and also have to teach. I should have some berry mojitos this weekend before things get hectic, hehe. Thank you for the visits, Sam 🙂 My mint is all about the cocktail possibilities! It’s simple enough to make cocktails at home, but there’s something fun about finding them in restaurants, too. Good luck with the grad school! Very exciting. Wishing you all sorts of (good) luck.